Take the box spanner and wire hook from the toolkit . Insert the wire hook into one of the holes in the wheel cover. Push the box spanner through the wire hook and remove the wheel cover in the direction of the arrow. 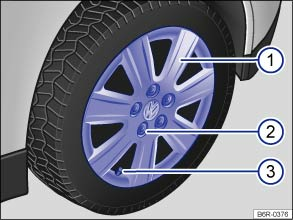 When a wheel cover is being fitted, it must be pushed onto the rims so that the hole for the valve is aligned with the tyre valve. Please ensure the cover fits securely all the way round. 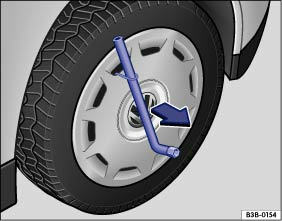 The wheel cover is secured with wheel bolts and cannot be removed. Remove the wheel bolts . Remove wheel cover with wheel. Put the wheel in place. Screw in the first wheel bolt at the height of the wheel valve ③ and tighten by hand. Push the wheel cover through the first wheel bolt and fix it. Fit the other 4 wheel bolts and tighten them hand-tight. Tighten all wheel bolts with the correct torque . The wheel cover can be firmly fixed and should not be removed using force.